Following the tragic crash between a gondola and water bus on Venice’s Grand Canal on 17 August 2013, Venice City Council proposed 26 new regulations on 26 August. The accident killed German university lecturer Jaochim Vogel and threw his family into the water, leading to minor head injuries to his 3-year old daughter. This was a terrible accident for the Vogel family and improvements to Venice’s busy canals are needed to reduce the chances of future accidents. Yet the 26 proposals by Venice City Council and Venice Mayor Giorgio Orsoni will make life more difficult for people in Venice without addressing the problem of congested canals. Details of the proposals are in this article in La Nuova Venezia on 26 August 2013: Canal Grande, la rivoluzione del traffico acqueo. It should be emphasised that these are currently only proposals and will be subject to negotiation with various different interested parties. 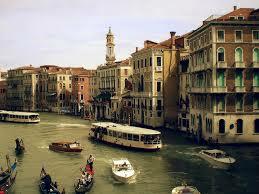 In particular, representatives of gondoliers, labor unions and citizens’ groups have raised concerns. Venice City Council and Venice Mayor Orsoni have established a clear policy orientation based on more regulation and competing services. This will not significantly reduce congestion or reduce the risk of accidents. In the aftermath of this tragic accident, reducing congestion in Venice will require bold proposals for infrastructure development.